→How long will the area be red? It should go away within two hours, however, clients who have sensitive skin may notice it takes up to a day. You can use a soothing cream to help get rid of the redness. 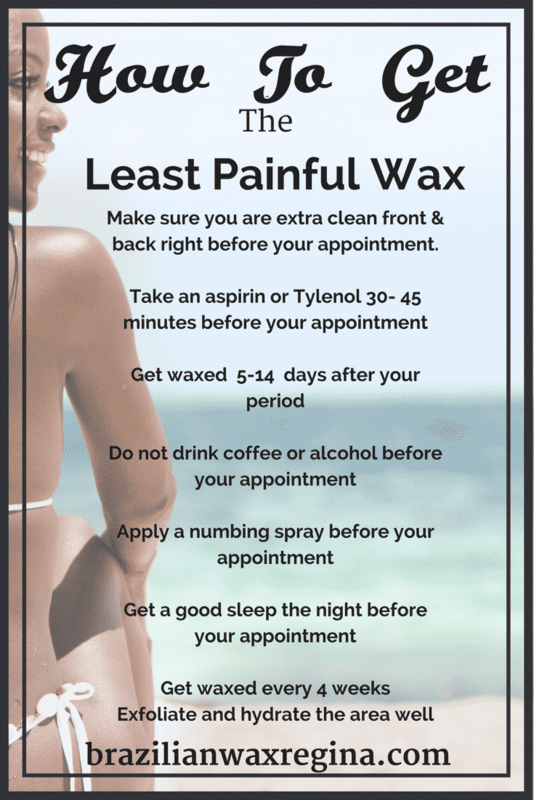 It would be rare that you would be “sore, or swollen or in pain” after your wax. →How long will the results last? First-time clients will notice the regrowth typically from 2 to 3 weeks . When you start to regularly wax on a schedule, the length of time between waxes will get longer generally four to six weeks. After your fourth or fifth visit at 4-5 week regular intervals, all your hair will be in the same hair growth cycle and will be a good waxable, length at the same time. You will start to see the same effect as regular waxers after further appointments. →How can I prevent pain? The least painful time to wax is 5-14 days after your period. Do not drink coffee or alcohol prior to your waxing appointment. Take an ibuprofen 2 hours prior to your appointment. Apply a numbing spray prior to your appointment. →How can I prevent ingrown hairs? See above in post care! →Will it hurt less the second time? Yes, because the hair is growing back as a new hair, it is softer and thinner and has a smaller root bulb. →How often should I get a Brazilian wax? In the first 6 months, I recommend every 4 weeks. After that every 4 to 6 weeks depending on your hair growth. →Can I be waxed when pregnant? Yes. There are no restrictions on waxing when pregnant and we have lots of experience waxing heavily pregnant ladies who come in right up to their due date. →Can I be waxed during my period? Hairs in the Anagen (growing) stage of the hair growth cycle is all supplied by tiny blood vessels. When an Anagen hair is forcibly removed by waxing, a small amount of blood may travel up through the channel in the skin that the hair was previously in. →Can I shave if I have to? You can but it will cause the hair to grow thicker and your next wax will be much more painful. →Why do you use so many different types of wax? Different types of hair need different types of wax. →Is sugaring better than waxing? No, you are pulling the hairs out by the roots with each method. The difference is that most waxes or oil soluble and most sugar is water soluble. 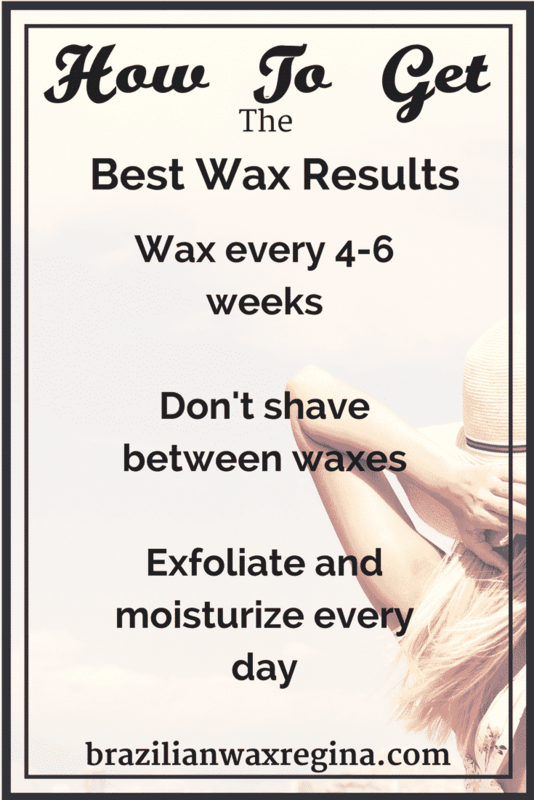 →How can I get the best waxing results? In the days leading up to your appointment, Moisturize and exfoliate! →Do I have to trim before I come? No. Don’t trim. Most people trim too much then the hair is too short to wax. Brazilian wax, Hollywood wax, bikini wax : noun a technique in which all or most of the pubic hair is removed with a hot-wax treatment. Brazilian Wax Regina Cathedral Area 306-525-1702 taniarice@sasktel.net Interested in other services I provide? When you book your appointment you will receive a confirmation email as well as a reminder email 36 hours before your appointment. Please give at least 24 hours notice when canceling your appointment. You can call The Spa at 306-525-1702 and leave a message on the voicemail. You may also cancel an appointment online after 18 hours before the appointment.